2. In a medium sauté pan, melt a couple of tablespoons of butter over medium heat and add mushrooms and onions. Sauté until mushrooms are golden brown and onions are soft and translucent. About 10-15 minutes. Set aside. 3. Once chicken is fully cooked, place on a baking sheet. 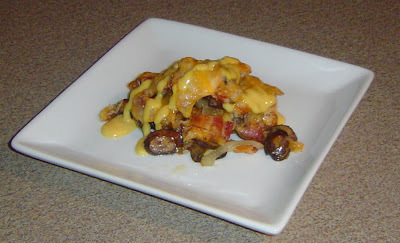 Top with mushrooms, onions, bacon and cheddar cheese. Place under broil for 4-5 minutes or until cheese is melted and bubbly. 4. Drizzle each chicken with ranch or honey mustard dressing. This is optional but it really does add something to the dish that I love. Thoughts: This really is a dish that I make often. When I don’t feel like putting in a lot of effort for dinner this one is easy and really yummy. I would also venture to say that you could get this meal on the table in about 30 minutes depending on what you serve with it. My suggestion? A salad. Seriously. The chicken is kinda on the heavy side, so a nice, simple salad works well with it. Or you can change it up and make this a great sandwich.